UK milk production, its decline and the influence of government policy. The purpose of this web site is to illustrate the differences between milk production in England, Wales and Scotland and report the most likely reasons why these differences have occurred. Emphasis is put on what has happened in the ten years since 2000/01. Fig 1 shows annual milk production in the UK for each financial year from 1994/95. This data is tabulated in Ref 1 and was downloaded from the Rural Payments Agency web site. Fig 2 breaks down the above production by country. Prior to super levies being last imposed in 2003/04 (as of Sep 2011), production closely followed quota. In Fig 2, this quota data is plotted up to 2001/02 and shows data taken from Ref 2. A computer manager at the Rural Payments Agency gave the following explanation for why production followed quota during these years. This extract was taken from an email response. For the years prior to 2005, the threat of a levy meant that on the whole, producers were reluctant to exceed their quota by very much. That reluctance translated into a willingness to pay to lease in extra quota, which meant that those with spare quota found it worthwhile to lease out. These two factors combined to ensure that the quota was distributed more or less in the same places as the production. It is possible, therefore, to produce an approximate map of where the production was in the years before 2005, by reference to the distribution of the quota at the end of each quota year. A more detailed explanation is given in Ref 20. Data shown in Fig 2 from 2004/05 onwards is based on actual monitored production. These monitored production levels were taken from Ref 3. Levels for the years 2002/03 and 2003/04 were taken from the quota share emailed to me separately by the RPA in Reference 9. According to the covering email, Reference 9 shows the percentage shares of the UK net quota for each of the home countries for the years from 1994/95 to 2010/11. These percentages need to be applied to the total UK production for each year in order to get the volume of milk produced by each country. Data from the three data sources described above are plotted in Figs 2 and 3 and all such data were sourced directly from the Rural Payments Agency either through a personal email or from downloads from their web site. Regarding trends, production in Northern Ireland has steadily increased and its share has increased by almost 5% from about 10% to about 15%. This is at the expense of the share supplied by England which has dropped by more than 5%. The share provided by Wales and Scotland have both steadily increased. Fig 3 shows how production has changed since 1994/95. Not only has Northern Ireland seen greater increase in its productivity than Great Britain and this is clearly evident from the start in 1994/95 but there is another clear trend. In about 2000/01 productivity in Wales and Scotland started to increase over that in England when England's productivity started to go into more rapid decline. This is consistent with the divergence in cattle numbers illustrated in Reference 5 from 2000/01 onwards. This diverging situation in both milk production and cattle numbers has steadily increased since 2001. Why has Northern Ireland's share increased substantially since 1994? Also, what caused England's productivity to go into more rapid decline from about 2000/01? Figs 4 to 7 show data from the same datasets as used for the above graphs except for the data received by email in Reference 9. Data shown in Reference 9 contained no county breakdown so is not shown. The figures show the volume of milk produced in the top 5 producing counties in each country. In 2001, the county in England most affected by Foot and Mouth was Cumbria where 209,106 cattle were slaughtered. The second most badly affected county was Devon where 67,677 cattle were slaughtered. These numbers were taken from Ref 4. Indeed it can be seen that Cumbria's milk production fell considerably in 2002/03. However Cumbria's milk production strongly increased in further years and shows the biggest increase from start to finish out of all the top 5 producing counties. This indicates that counties which suffered big losses due to Foot and Mouth may not have seen overall reductions in milk production and may in fact have benefited. Also Devon has seen a significant increase in its milk production since 1994/95. This goes against the overall trend in England. Increased milk production in Devon is rather surprising because Devon is a county which is badly affected by bovine tuberculosis. What are the overriding drivers which controlled milk production levels in the UK which may explain the trends shown in these graphs? The sections below give some background and perhaps some answers. In 2000 (when dairy farm income in Great Britain was extremely low) agriculture accounted for 2.4% of economic output in Northern Ireland, compared to 1% in the United Kingdom as a whole. As in the rest of the United Kingdom, livestock and dairy account for the majority of agricultural output. More than 80% of Northern Ireland milk and milk products are exported to over 100 countries, including Great Britain, Europe and many countries outside the European Union. This is in stark contrast to Great Britain which is a net importer of dairy products. Consequently the dairy industries in Northern Ireland and Great Britain operate in different markets so will be subject to different pressures. Compensation payments for stock lost due to Foot and Mouth in 2001 were too generous.6 Farmers were able to use these payments to increase the number of their cattle. This probably explains why milk production in counties such as Cumbria, Devon and Dumfries, where many cattle were slaughtered,4 increased after 2000/01. In the financial years between 1994/95 and 1999/00, there were a succession of years when milk quota was breached and farmers were penalised heavily for over production. In England quotas were last exceeded in 2003/04 (as of Sep 2011). In theory this should have hit Welsh and Scottish producers as hard as it hit English producers. It is possible however that certain countries in the UK shouldered some of this levy. Quota payment however is an area which is currently unknown to the author as the Rural Payments Agency were unable to provide this information when first requested. Further follow-up queries are planned. Anthony Blair in 2001 commissioned the Sir Donald Curry report titled "Farming and Food, a sustainable future" which advocated moving subsidy from production to the environment.8 Margaret Beckett was Secretary of State for Environment, Food and Rural Affairs between 2001 and 2006. It was during these years that the divergence between milk production in England and milk production in Wales and Scotland occurred. During these years Margaret Beckett fought strongly to reduce subsidy payments to farmers who wanted to produce and this may have impacted on farmer confidence and moral and perhaps decisions by farmers in England to cease production. As was pointed out in Reference 7, the Common Agricultural Policy reform which was sanctioned in February 2004 allowed Scottish and Welsh farmers, who were under different jurisdiction to farmers in England, to enjoy the support of historic payments, as did many others in the single European Market. However English farmers were under the jurisdiction of Margaret Beckett and did not have this support. This drive to reduce production-based subsidy in England is likely to have contributed to the disparity between English production and production in Wales and Scotland shown in the above graphs. This is further examined in the following sections. In view of the commitment, investment and extent of non-returnable asset which goes into setting up a running farm, farmers usually do not quit before retirement age unless they are given no choice such as when they hit financial difficulties. From year to year, farm income is subject to changes including milk price received, subsidy received from the government and super levy which has to be paid by farmers when milk quota is breached. In order to identify why more farmers ceased production in England than in Scotland and Wales from 2001 onwards, differences in these ingoings and outgoings need to be considered. Regarding average milk price received in England, Wales and Scotland, these are shown in the graph below (Reference 11) where prices received by farmers in Scotland can be compared with prices received by farmers in England and Wales. Evidently prices received by Scottish farmers closely match those received by farmers in England and Wales. This is strong indication that received milk price is not the reason for why milk production is reducing in England and not in Scotland. Since the price is averaged in England and Wales and there is much more milk produced in England than in Wales, the England and Wales prices should closely follow those being received in England. Consumers now buy most of their milk from supermarkets. Any squeeze applied by supermarkets initially goes to processors who then set prices received by producers. The equality of milk prices received by farmers would suggest that the influence of supermarkets on the financial return to farmers is not significantly different in England to what it is in Scotland. Regarding government policy and financial aid, Reference 10, which came out in December 2000, compares policy in each country and states the following. The set of three Rural White Papers published for England, Scotland and Wales in 1995/96, though common in many respects, showed notable differences in the relative priority accorded to economic or community development and to environmental protection. The Scottish and Welsh White Papers were more preoccupied with the question of how to sustain rural communities and ensure their cultural and economic vitality, whereas the English document discussed the countryside more through the need to reconcile economic and environmental objectives. More recently, differences in emphasis have been reflected in the Rural Development Plans for England, Scotland and Wales. The English Plan is geared more towards agri-environment, than the others, while spending on Less Favoured Area (LFA) aid is more significant in Scotland and Wales. For example, the proposed allocation of spending on agri-environment measures accounts for around 20% in Scotland, 35% in Wales and 60% in England, while proposed spending on LFA aid comprises 40%, 40% and 18% respectively. Evidently government policies in Scotland and Wales are a lot more geared towards supporting production. The SFP will be implemented on a different basis in England, Wales and Scotland. In Wales and Scotland the SFP will be based on an historic basis, meaning that farmers will paid on what subsidy they received during 2000- 2002 and how much quota they hold on the 31/3/2005. In England the SFP will be paid on a predominantly historic basis initially, but will be increasingly based on the amount of land farmed in 2005, until the payments are entirely based on land rather than historic receipts. In England, a well-run, average-size, dairy farm currently receives about £18,000 per month for selling milk and a Single Farm Payment of about £15,000. The selling of cull cows and calves in the last 12 months would have brought in about another £25,000. The Single Farm Payment in England was set up in 2005 so that subsidy was 100% based on production from 2000 to 2002. This proportion each year has slid from being production based to area based. The payment is now based on about 15 to 20% production. This current proportion gives the £15,000 payment referred to above. This report was written in 2011 and payments in 2012 will have no historic element.13 From this and the description of the payment of the SFP described above, it can be seen that in Scotland and Wales, for an intensively run type of farm, which a dairy farm is, the payment is a lot more generous and represents a substantial part of the annual income. It should be noted that this may not give a complete picture because dairy farmers in member states also receive financial support from the EU for projects outside the Single Farm Payment. Dairying is an intensive way of farming. Beef, sheep and arable are less intensive and more dependent on area. The following table shows the proportions by which farm types have changed in each country in the UK between 2000 and 2008. The quoted percentages have been taken from Reference 12. It would appear from the above table that in England many farmers who quit dairying took up beef farming and to a lesser extend sheep farming. Judging by the change in land area under arable production, there was not a significant shift into arable farming. In fact the largest reduction in arable production took place in England. Milk production in Scotland and Wales has clearly increased whilst production in England has declined and this diverging situation has steadily got worse in the last 10 years since 2001. Since a lot more milk is produced in England than in Wales and Scotland, the deteriorating production in England is largely responsible for the UK decline. Data shown in this report indicates that this difference may not be due to the difference in retail pressure exerted by supermarkets in the different countries. Indeed the prices passed down from supermarkets and processors in each country were closely matched between 1996 and 2005. However the governments in Scotland and Wales, which became devolved in 1997/98, put significantly more emphasis on rewarding farmers for production than the government in England. This is reflected in the way in which they split subsidy between production and the environment. In fact out of the total subsidy received by farmers, spending on environmental measures in England in 2000 was about 60%. This was about double that in Scotland and Wales. Lack of reward for production, and perhaps the more involved paperwork associated with claiming environment-linked subsidy, appears from the data and findings presented in this report to be the main reason why milk production in England, and hence the UK, has declined in the last decade. Since milk production in both Wales and Scotland have both increased and retail pressure in England and Scotland appears to be evenly matched, the influence on this shift in production of retail pressure from supermarkets appears to be far less than the influence of how subsidy is based. It remains to be seen how government policy in each country will impact on milk production in the light of proposed CAP reforms17 and the expressed intention16 to remove milk quota altogether. The UK's strong wish to further substantially reduce subsidy for production is very clearly stated in the reply from DEFRA sent on 16 Feb 2012 in Reference 19. In fact the following is an extract taken from this reply. The UK wants a very substantial cut to the CAP budget, focused on Pillar 1. Actually England wants a very substantial cut to Pillar 1. Wales, Scotland and Northern Ireland are not so keen. Monthly UK milk production from 1994 to 2011. Rural Payments Agency. Numbers of Cattle slaughtered per month by county due to Foot and Mouth in 2001. Defra. The 2001 outbreak of Foot and Mouth disease. House of Commons. Committee of Public Accounts. Fifth Report of Session 2002-03. Actors, Institutions and Attitudes to Rural Development:The UK National Report. December 2000. Economic trends in Scottish agriculture. Scottish Government Rural and Environment Analytical Services. 2009. Single Payment Scheme. Wikipedia. 2011. Dairy facts and figures 2003. Milk Development Council. Published September 2004. Video of a parliamentary debate on the future of dairy farming in England. Called by Dr Daniel Poulter. 7th June 2011. Common Agricultural Policy. Wikipedia. 2011. Ireland sees potential for big milk export push. Dairy Reporter. July 2010. CAP Reform and Dairy Production. Correspondence with DEFRA in February 2012. 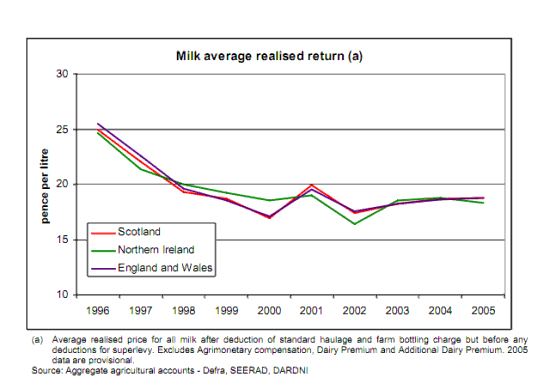 Calculation of regional UK milk production volume before and after 2004/05. Rural Payments Agency email. 2011. An Assessment of the Short to Medium Term Outlook for Global Dairy Markets. Rural Economy Research Centre, Teagas. September 2009.